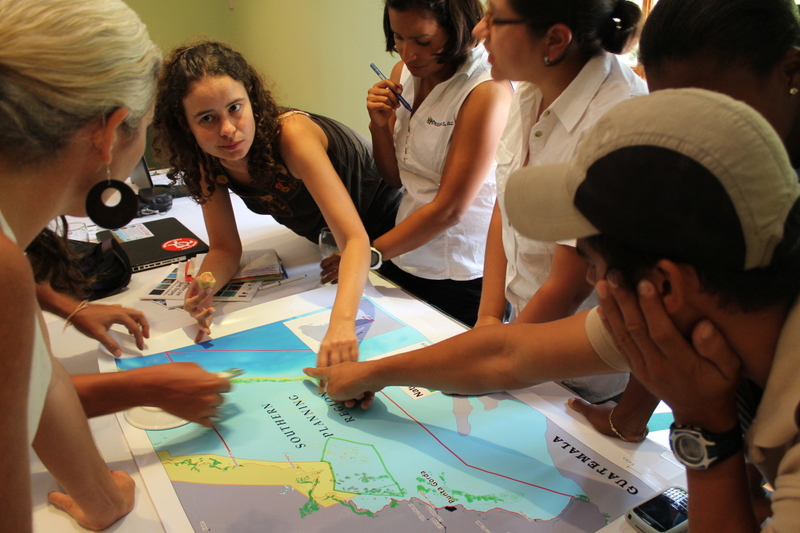 Ecosystem services were mapped and valued in a participatory process that included designing spatially-explicit scenarios of future human uses throughout Belize's coastal zone. To understand the implications of different development scenarios, the team used InVEST models to map future value of coastal protection, recreation, and fisheries services. 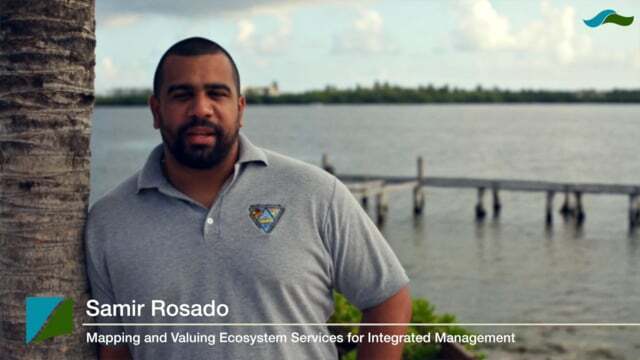 The resulting Plan can help the people of Belize plot a wiser course for managing the incredibly valuable resources their ocean and coast provide. 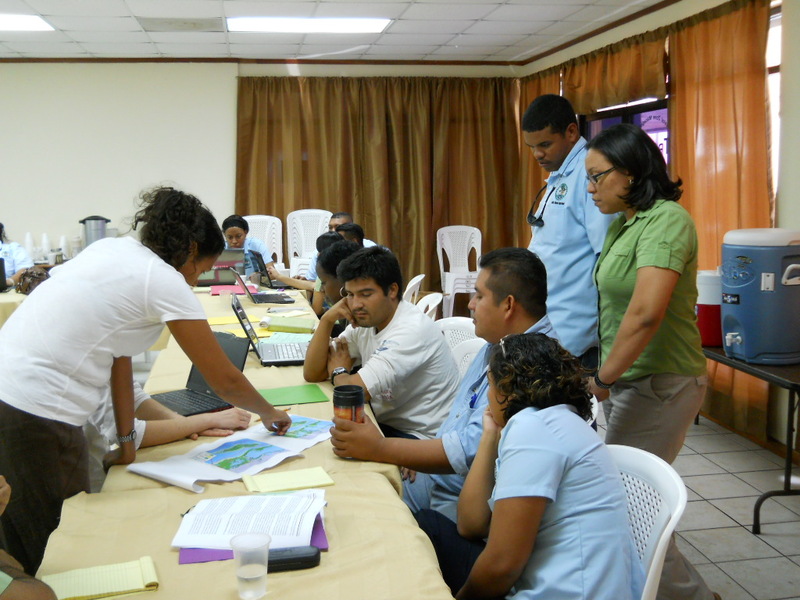 These three building blocks illustrate the science-policy process carried out in Belize. It includes an emphasis on iterative stakeholder engagement, advancing science to address policy needs, and capacity-building through six general steps: (1) scope the process, (2) collect and compile data, (3) develop scenarios, (4) analyze ecosystem services, (5) synthesize results, and (6) communicate knowledge. Mapmaking makes a difference in Belize Gregg Verutes, WWF GIS analyst: As an expert in GIS mapping, I expect my maps to work behind the scenes. The multilayered depictions I construct to illustrate the ways we use and value nature, usually inform scientists, practitioners and policy makers. They rarely feature prominently on televised efforts to secure sustainable national energy policy. But exactly that happened recently in Belize. A simple map I made at the urging of a tour guide helped defeat a proposal to intensify offshore oil drilling. Our team was in Belize for a training but Hurricane Rina forced us to cancel. I took advantage of the free time to visit the Mayan ruins. As we bounced along the winding road in a jeep, my guide Carlos inquired about my occupation. I explained that I translate data about the potential environmental impacts of natural resource use into visual representations of how nature benefits people. “Oh, so you make maps?” he asked. “Yes, basically.” His face took on an excitement I rarely see when discussing GIS. “You know what would be great? Make a map of the US Gulf oil spill and put it on top of Belize!” he said. “People are arguing about oil drilling around Belize. It would help to show what’s at stake if a similar disaster happened here.” It was one of those light bulb moments. As a mapmaker I have a pretty good sense of the relative size of various countries and bodies of water, but the map I created surprised even me. I knew that the oil spill would look large compared to Belize, but I was taken aback to see how thoroughly the black splotch covered its coastline. The map showed how an oil spill of this magnitude off the coast of Belize would devastate the country. Almost half of Belizeans draw their livelihoods from the coast, whether from fishing, tourism or other ocean-oriented occupations. I sent the map to an organization called Healthy Reefs for Healthy people Initiative, which started incorporating the image into signs and television ads that urged people to vote “no” in the upcoming People’s Referendum. In the end over 90 percent of Belizeans voted against oil exploration and drilling offshore. The map was made with advanced technology, but needed no explanation. The arresting image showed starkly how valuable nature is to the health and well-being of the people. And those people took action to protect the ecosystem they depend on. What more could a humble mapmaker ask for? This solution is published in the Marine and coastal portal.